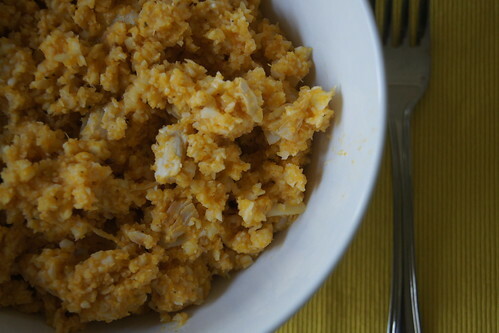 Many readers tried out my Cauliflower Rice recipe with great success, so I thought I would share an offshoot of that recipe – Cauliflower Risotto. This risotto is rice, cheese and cream free, making it Paleo friendly, but most importantly, it is a great tasting dish. 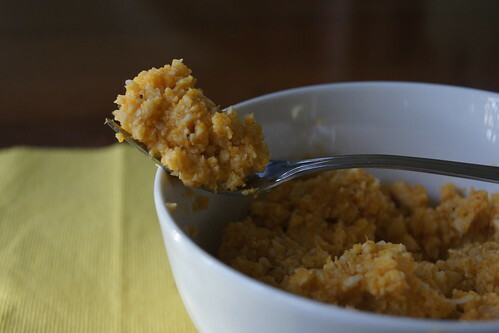 It uses mashed pumpkin as a key ingredient so is also a fantastic way to use up any excess you might have left over from another meal. If you don’t have any left over it is easy enough to steam up some pumpkin to make the risotto. I created this recipe when I was undertaking the Zone challenge. This recipe equates to three, three block meals. This dish is quite versatile and you could add any leftover meat and veg you had to pull it togehter. The texture of the dish did really resemble that of a risotto. I reheated the dish the next day in the microwave for lunch and is still tasted great. 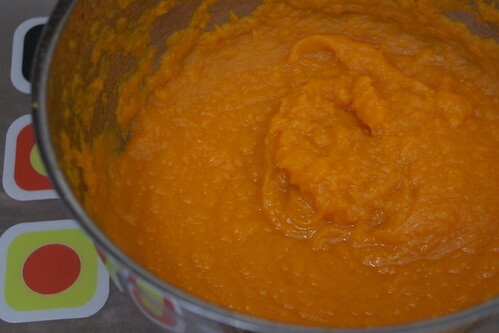 Chop pumpkin and steam for 10 - 15 minutes until it is soft so you can make mashed pumpkin. 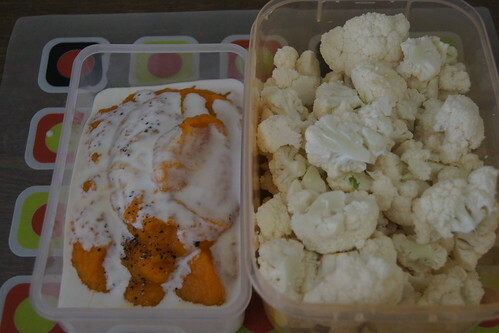 While this is cooking, chop up cauliflower into small pieces, removing the thick stems. 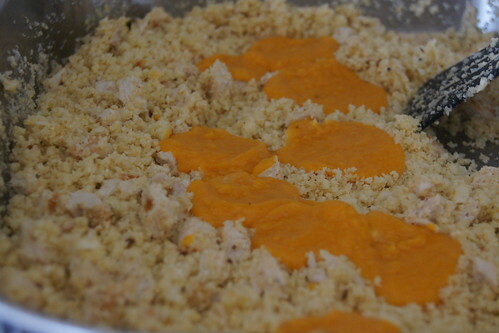 Place the cauliflower into a food processor and pulse cauliflower until it is a fine consistency similar to couscous. Add spice mix and stir for another minute or so. Place lid on the frying pan and cook on very low temp for about 10 minutes. While the cauliflower is cooking, mash up the pumpkin. Once smooth add coconut milk, salt and pepper to the pumpkin and mix well and set aside. Pan fry the chicken breast, so it is nicely browned, then chop it up into small pieces. Test that the cauliflower is the right texture for you. The longer it cooks the softer the cauliflower becomes. Once you are happy with it add the chicken to the frying pan and combine well. Slowly add the mashed pumpkin, mixing gently as you add it. What have you been creating in the kitchen?